Impending fuel shortages, increased concerns on truck exhaust emissions, regulatory angst as politicians strive to be seen to do something … sound familiar? With this backdrop, Hino, in early 2007, became the first major truck manufacturer to release a viable alternative-fuel truck for sale to the general public. The first batch of trucks were shameless self-promotion for the company; the technology and cab design were outdated before they even went on sale. But as a branding and awareness-building exercise it was a success. Fast forward to 2009: the backdrop has been repainted. 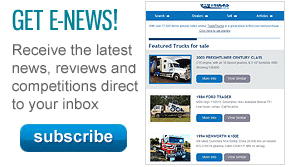 The entire planet is attempting to dig itself out of a huge financial hole; vehicle sales of all types, but especially trucks, have plummeted. Yet there is a constant — the need to develop and refine fuel-efficient, low-emission trucks able to carry the same load as their fuel-guzzling forebears. 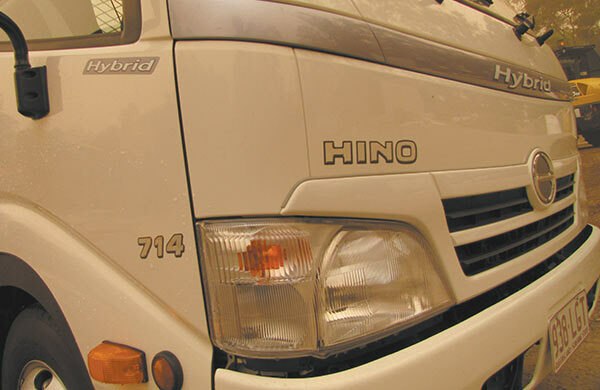 Enter the new Hino 300 hybrid, a development of the original hybrids. Now using the current 300-Series chassis, it incorporates a Euro 5-compliant engine supplemented by a revised electronic power unit with improved controllers and charge storage. Known as the 714, a 6,500kg GVM with a 140hp (104kW) engine, the new hybrid is a regular production variant. Importantly, almost all of the switchgear is interchangeable, with the exception of the idle-stop system (unique to the hybrid, more on that later). The best part about making the hybrid a regular production unit means it now shares virtually everything with the other models in the range, including the cab design (it’s one of the more spacious cabs among under 8-tonne GVM trucks). Just like the other 300-Series trucks, the hybrid offers plenty of head, shoulder and leg room. There’s space for three across the bench seat, the middle seat can be flipped up to create storage space as well transforming into a worktable with cupholders. The other equipment was as expected, including standard air-conditioning, hill-start assist, an exhaust brake (with column-mounted switch) and an AM/FM/CD stereo (with twin extendable antennas for good signal capture). All switchgear is ergonomically laid out. The big windscreen offers a wide field of view, and sizeable mirrors not only give excellent vision but are positioned to reduce blindspots (a lesson a few other manufacturers would do well to learn). The mirrors also fold back into the body to reduce the chance of cyclists and other nuisances making contact while parked. The flooring is hard-wearing nonslip vinyl, an important feature for a truck bodied as a tipper — even if you are out in the mucky stuff there are no guilty feelings about climbing in with dirty boots (the edging on the cabin step scrapes the worst off anyway). Owner//Driver took a brief drive when the hybrid was first launched — a north-south Sydney crossing from Taren Point to Warringah. Since then the hybrid has remained a mystery, with TNT’s decision to introduce them to suburban operations being the biggest hybrid news of 2008. That is not to say the hybrid has disappeared, only that it has dropped off the front page and become a handy weapon in Hino’s armoury. 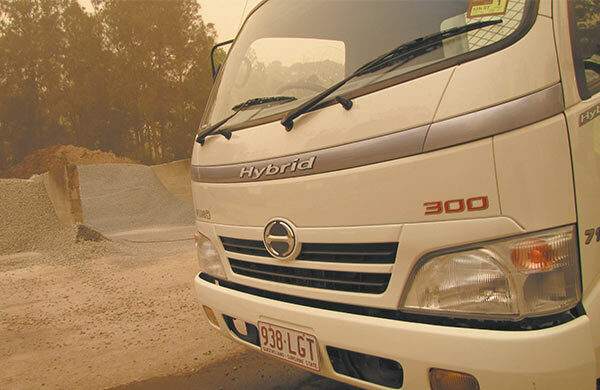 That was until a chance conversation revealed a 714, bodied as a tipper, was at Gold Coast Hino, less than an hour’s drive from Owner//Driver’s Brisbane bunker. Time to really put the thing through its paces. The first question asked by many curious bystanders when they see the hybrid branding is: how does it work? Pretty well, actually. The best answer comes by way of a lesson, explaining how the prime mode of motivation remains the 4.0-litre, direct-injection, four-cylinder, intercooled turbo-diesel engine. But there is also a 36kW (49hp), 288-volt electric motor to give extra an kick in the pants when required, such as on take-off and when climbing hills. Best of all, the electric motor is imperceptible during regular operations. It effectively takes the place of the flywheel, positioned between the engine and gearbox, which is how the regenerative braking system — like the kinetic energy recovery system used in Formula One racing — works so effectively. While the driver is accelerating, or has their foot on the accelerator, the electric motor spins in the same direction as the crankshaft. Neither the driver nor bystanders would be aware of anything unusual. However, take your foot off the accelerator and everything changes — big time. Suddenly the electric motor becomes a generator and reverses direction, which also helps slow the crankshaft thus slowing the truck quite markedly. 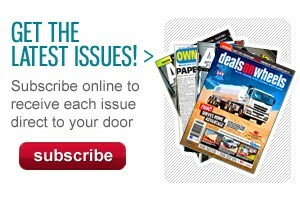 Indeed, in our experience, there is virtually no need to use the brake pedal when driving normally. The combination of exhaust brake and electric generator pretty much take care of the stopping duties. Even so, you get disc brakes all round. The ‘regenerative’ part of regenerative braking is that the slowing of the truck spins the generator to produce electricity. The charge is stored in the nickel-metal hydride battery, ready to be used the next time the truck tackles a hill or needs a little extra kick. The whole operation is better than on the original Dutro-based hybrid. The electric motor/generator now weighs just 40.8kg, more than 17kg lighter than the previous version, while the inverter, which converts the DC battery power into the AC power needed by the electric motor, is twice as powerful as its predecessor yet half a kilo lighter. Most importantly from an operator’s perspective, the hybrid drive system is a sealed unit that needs no special attention or servicing. In fact, Hino actively discourages people from touching it. In terms of day-to-day operation the 714 is no different from its 716 or 718 brethren. With a tipper body on the back, there was only one place to go — straight to the landscapers. 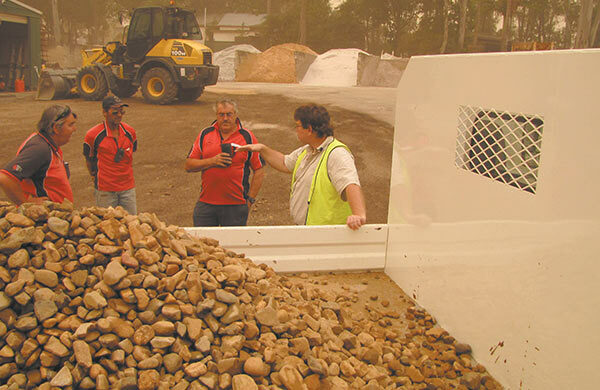 We loaded up about 2.5 tonnes of gravel and went for a spin. Despite weighing in around 5.5 tonnes, the first thing you notice is the hybrid is still a reasonably-spirited performer. A green light came on to let us know the electric motor had joined the party. While the truck was not about to race a Kia Rio at the traffic lights, it didn’t struggle along as though it was only firing on three cylinders. This is the key: even with a decent load on board and belting along at a sustainable 70km/h, the hybrid is still only putting out the same emissions as a 4.5 tonne truck. Basically, the electric motor removes the need for a 6-litre engine. So even under full load the combined 4-litre and electric motor are providing the same performance, but without the fuel consumption or exhaust emissions (and when it is not loaded, the diesel motor is more than capable of doing the job). Don’t ever fall into the trap of trying to out-brake it — you will be suddenly very embarrassed. The regenerative braking, in combination with the exhaust brake, offers the same level of retardation as a much bigger engine fitted with an engine brake. In a couple of tests while hauling the gravel, we found the hybrid would stop under normal circumstances in roughly the same distance as a passenger car. Even emergency stops can be carried out with real confidence. Hino engineers put a lot of thought into making the 714 Hybrid as fuel-efficient and environmentally friendly as possible. One bright idea they hit on is idle-stop. With plenty of documented research showing how much fuel is wasted by an idling truck those clever boffins at Hino found a way to shut the engine down at traffic lights. Simply push the button on the lower left of the dash marked ‘Idle Stop’, pull up with your foot on the brake, and then put the transmission into neutral and release the clutch. The result: complete silence as the diesel engine shuts down. To restart push the clutch in, the electric motor spins the crankshaft up to 400rpm, a nice healthy restart speed, and immediately you are back in business. Admittedly this is not always a good thing: like if it is 30 degrees outside and you are in the middle of a choking dust storm (as the photos attest), in which case niceties like air-conditioning become compulsory. In such instances just leave the Idle Stop off and you would never know it was there. However, Hino has recognised the need for air-conditioning even when the engine is off — word is they are developing an electric unit, including fans in the cabin. This is possibly where one of the biggest misunderstandings about the hybrid comes from. Most bystanders see the twin batteries for the starter motor — lights, radio and so on — and assume this is where the power for the hybrid drive comes from. In fact, there are two separate electrical systems involved: the 24-volt power for the regular vehicle electrics, the same as every other Hino 300 Series, and the hybrid system, which exists only to help the diesel motor with acceleration and draws its power from the regenerative braking system. Owing to the significantly different voltages involved — 24 versus 288 — the two are completely different. One cannot power the other. In the meantime, operators keen on encouraging drivers to take advantage of idle-stop could do well to institute fuel-efficiency competitions so that drivers will do everything they can to drive the hybrid the way it is intended. And that is probably the key to the success of the hybrid: it has to be used in the right application. Otherwise it can become a very expensive failure. For example, when we picked up and then returned the hybrid it involved 50 minutes-plus of continuous highway driving at 100km/h — not much fun in a truck with a tall diff ratio designed to help acceleration but which is completely out of its depth on the highway. Even in top gear the engine was pulling 2,000rpm, rather than the 1,200 to 1,500rpm of optimum economy. Also, because it was a constant speed, there was no chance for the electric motor to help out, so it was basically windmilling inside the bell housing, doing no good at all. If this is the sort of work you do, then stick with the 716 or 818 diesels, they are ideal for that type of work. However, once we were in the landscapers and loaded up, doing runs around suburban streets and in and out of job sites on a couple of convenient housing developments, it was a different case. With the highest speed limit being 80km/h and most of the driving between 50 and 70, as well as traffic lights, stop signs and even a couple of roundabouts and driveways, the regenerative braking was doing its thing. The little blue ‘ECO’ light threatened to burn itself out such was the heavy workout; the same as the ‘Assist’ light telling us the electric motor was engaged going up hills, pulling out from house blocks and obeying traffic lights. 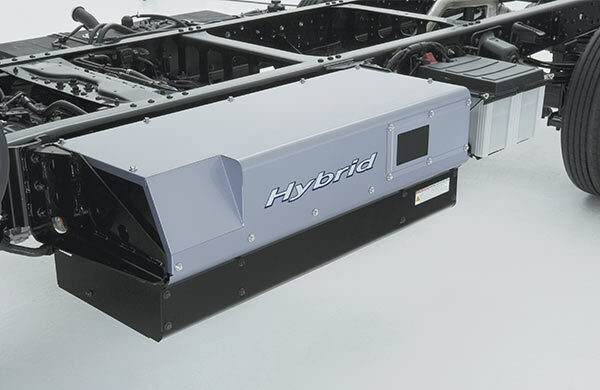 Although the Hybrid is still relatively new to the market, with limited ‘whole of life’ data available, the anecdotal evidence from operators who have tested it is that it takes a couple of years of operations to recover the extra cost of adding the hybrid drive system. But the operators are confident the reduced brake wear, including pads and rotors, courtesy of the regenerative braking should result in one less brake change. That in itself is a big saving. Either way, this is no longer a publicity gimmick; this is a genuine workhorse capable of holding its own in the right application. And with real environmental credentials. 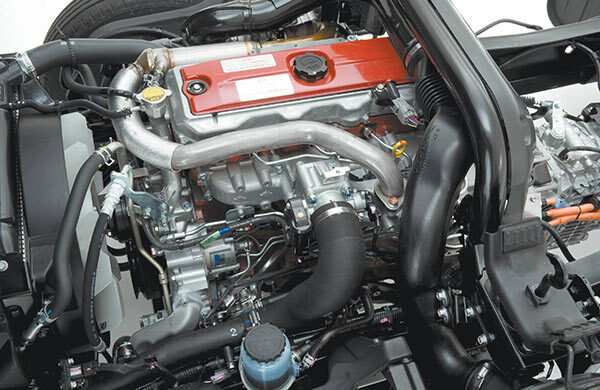 Engine: Hino NO4CTN 4-litre turbocharged, intercooled four-cylinder; direct-injection EGR emission control.